In December 2016, during the twilight of President Barack Obama’s 44th presidency, the World Trade Organization (WTO) conducted a Trade Policy Review (TPR) of the United States of America. All members of the WTO are subject to review under the Trade Policy Review Mechanism (TPRM). The TPRM takes place in the “Trade Policy Review Body which is actually the WTO General Council — comprising the WTO’s full membership — operating under special rules and procedures” (Source: WTO, Trade Policy Reviews: Brief Introduction). 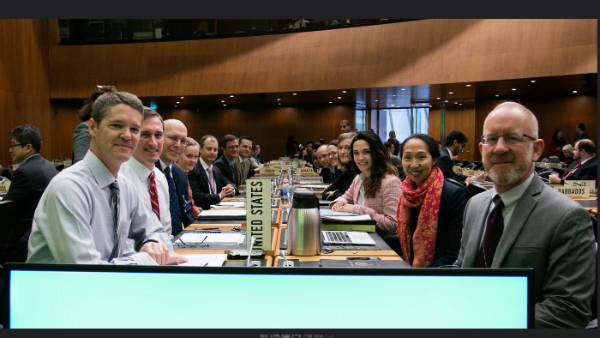 The questions raised by WTO members during the US TPR included, inter alia, Bayh-Dole provisions, the implementation of the WIPO Marrakesh Treaty for the Blind, compulsory licensing and government use provisions, US state practice on standards essential patents and the United Nations Secretary-General’s High-Level Panel (UN HLP). KEI obtained the 391 paged room document “unofficial room document” (RD/TPR/740, 19 December 2016) containing the advance written questions submitted by WTO Members and the responses provided by the United States. Although the proceedings of the WTO TRIPS Council have received much scrutiny during discussions of the Trans-Pacific Partnership, the Paragraph 6 system, innovation and intellectual property, the Havana Rum case and tobacco plain packaging, the WTO’s trade policy reviews have not traditionally attracted the same level of attention. While discussions within the Trade Policy Review Mechanism are often routine in nature, this is not always the case – as this post will highlight. Perhaps a more diligent examination of the goings-on of the WTO’s Trade Policy Review Mechanism is merited, to provide more insight into how TRIPS flexibilities are treated in the WTO system. The following piece is a walk-through of the December 2016 trade policy review of the United States in the context of IPRs and access to knowledge. The following extracts are taking from room document RD/TPR/740. 16. The report notes that in April 2015, the U.S. House of Representatives’ Committee on the Judiciary completed its series of hearings to review the current state of U.S. copyright laws. Has the U.S. House of Representatives’ Committee on the Judiciary review of U.S. copyright law now concluded and, if so, what is the outcome of that review? In particular, has the Committee recommended any legislative action or policy measures to address any issues? RESPONSE: The United States continuously seeks to improve its system for copyright protection and enforcement. The U.S. delegation is not aware of any developments beyond the public information provided by the Committee Chairman and Ranking Member of the House Judiciary Committee, available on the Committee’s website, dated December 8, 2016. The Committee has not proposed legislation related to the copyright review. 17. It is understood that the goal of the Committee’s review has been to determine whether the copyright laws are still working in the digital age to reward creativity and innovation. Has there been any noticeable trend (decline or increase) in the level of online copyright infringement in the U.S. in the past 12 to 18 months and, if so, what factors may have influenced this? RESPONSE: The United States Government has not collected information on such a trend that would enable the requested analysis. 18. It is understood that (in the wake of the Committee’s review) the U.S. Copyright Office is currently conducting a study to evaluate the operation of the ISP safe harbor provisions of section 512 of title 17, United States Code. What is the estimated timeframe for the conclusion of this evaluation? RESPONSE: The U.S. Copyright Office has commenced a study to evaluate the impact and effectiveness of the safe harbor provisions contained in section 512 of title 17, United States Code (for details, see https://www.copyright.gov/policy/section512/). This public study was initiated by a request for public comments issued on December 31, 2015. Public roundtables were held in May 2016 in San Francisco, California and New York City, New York. A second round of comments has been requested so that interested parties can reply or expand upon issues raised in written comments submitted in the first round of comments and during the roundtables; parties are also invited to submit empirical research studies assessing issues related to the operation of the safe harbor provisions on a quantitative or qualitative basis. These comments are due on February 6 and March 8, 2017, respectively. The Office will continue its work into 2017; an estimated date to deliver its final work product to Congress is not available at this time. The United States is a member of the World Intellectual Property Organization (WIPO), and participates in a large number of international conventions and treaties related to intellectual property rights (IPRs). 35. The United States supported WIPO’s Marrakesh Treaty to Facilitate Access to Published Works for Persons Who Are Blind, Visually Impaired or Otherwise Print Disabled. Are there ongoing plans for its ratification? RESPONSE: The President submitted the treaty to the United States Senate for ratification on February 10, 2016. We remind Members that TPRs are retrospective reviews. We look forward to keeping the Membership informed. With respect to new legislation on copyright approved during the review period, in July 2014, the U.S. Congress passed the Unlocking Consumer Choice and Wireless Competition Act, which reestablishes a limited exemption to prohibitions on circumvention of certain technological protection measures for the purposes of “unlocking” wireless telephone handsets to allow cell phone owners to connect to different wireless network providers. The President signed the Act into law on 1 August 2014. In addition, the U.S. Copyright Office completed its sixth triennial rulemaking proceeding under Section 1201 of Title 17 of the U.S. Code. The primary responsibility of the Register and the Librarian of Congress in the rulemaking proceeding is to assess whether the implementation of access controls impairs the ability of individuals to make non-infringing uses of copyrighted works within the meaning of Section 1201(a)(1). The Register of Copyrights forwarded her Recommendation to the Librarian of Congress, who adopted the recommendations and issued the Final Rule which resulted in regulations adopting limited exemptions from the general prohibition against the circumvention of copyright protection systems for access controls. 38. Could the U.S. elaborate on the scope of the exceptions and limitations adopted to allow for the circumvention of technological protection measures? RESPONSE: Section 1201 provides certain permanent exemptions to the prohibition on circumvention of access controls and, in some cases, copy controls. Separately, section 112 includes a limited permanent exception to section 1201 for purposes of making ephemeral recordings. In addition, section 1201 instructs the Librarian of Congress to make determinations in a rulemaking proceeding every three years, upon the recommendation of the Register of Copyrights, evaluating and, as appropriate, adopting limited exemptions for the ensuing three year period from the general prohibition against circumvention of access controls. The Copyright Office maintains a webpage that contains links to the public comments, the Register’s Recommendation, the Final Rule announcing the exemptions, and a document addressing Frequently Asked Questions about the rulemaking. An Introduction to the Register’s Recommendation summarizes the exemptions and the rulemaking process. Based on the Register’s recommendation, in this latest rulemaking the Librarian adopted exemptions covering twenty-two types of uses. All information related to the Sixth Triennial Rulemaking is available at: https://www.copyright.gov/1201/. Section 3.3.6.1. Intellectual Property Rights – Overview (3.240) The Report mentions that the Bayh-Dole Act allows universities, non-profit institutions, and small businesses to obtain patents arising from research funded by the Federal Government. 50. What compensation do these entities provide to the Government in order to obtain title to inventions made with Federal funding? RESPONSE: The Bayh-Dole Act enacted in 1980 enabled universities and other non-profits, as well as small businesses (called “contractors” in the Act), to own patents resulting from government-funded research. To protect the government interests, the Act reserves to the government certain rights in the results of federally funded R&D. These rights include a nonexclusive, nontransferable, irrevocable, paid- up license to practice or to have practiced the invention for or on behalf of the United States throughout the world. Also, the government retains march-in rights and, if certain statutory conditions are not met, can require a contractor to license the patents on reasonable terms. The government also has the right to file patent applications anywhere the contractor does not file and has the right to pursue any U.S. or foreign patent or application which the contractor elects to abandon. Furthermore, the government receives a number of indirect benefits from the commercialization of government-funded inventions by private entities in the form of taxes as a result of the creation of new jobs and new products. 51. What metric is used to determine whether a business qualifies as a “small business”? RESPONSE: Bayh-Dole provides that small business concern shall be defined as provided at 15 U.S.C. 632 and implementing regulations of the Administrator of the Small Business Administration. 52. Will the Federal Government assist in any capacity an entity to defend against alleged patent infringement at any time during the commercialization of the patent before or after it has been transferred? RESPONSE: A person that elects to retain title to a federally-funded invention and files patent applications – as the owner of any resulting patents – would expect to be responsible for enforcing its patent and for defending itself against any patent infringement claims. The Report indicates that the STELA Reauthorization Act of 2014, signed into law in December 2014, extends until 31 December 2019 the statutory licence under which satellite carriers retransmit distant television broadcast stations to viewers who are unable to receive signals for such stations in their local market. 53. What are the remuneration requirements under the statutory licence? RESPONSE: Under the STELA licenses, satellite carriers are required to deposit, on a semiannual basis, with the Copyright Office a royalty fee payable to copyright owners for the retransmission of distant signals in underserved markets. As of January 1, 2017, the royalty fee will be 27 cents per subscriber per month for carriage of each broadcast signal for private home viewing and 57 cents per subscriber per month for carriage of each broadcast signal for viewing in commercial establishments. 54. How are remuneration levels set? RESPONSE: Where applicable under STELA, Copyright Royalty Judges, in the absence of a voluntary agreement among satellite carriers, distributors, and copyright owners, conduct a proceeding under sections 802 and 803 of the Copyright Act to determine the amount of remuneration in the form of royalty fees that represent the fair market value of secondary transmissions, taking into account information set forth in section 119(c)(1)(F)(ii) of the Copyright Act. 55. How does the U.S. use IP provisions in its trade agreements to encourage innovation, while balancing this goal with the need to ensure that IP protection in its trade agreements do not act as a barrier to innovation? RESPONSE: The United States seeks to include provisions in trade agreements to protect intellectual property and to combat counterfeiting, piracy, and other infringement, including trade secret theft; obligations to facilitate legitimate digital trade, including trade in creative content; and provisions to promote development of, and access to, innovative and generic medicines. Examples of how the Trans-Pacific Partnership (TPP) Agreement promotes innovation and creativity can be found in the fact sheet at https://ustr.gov/wp-content/uploads/TPP-PromotingInnovation-and-Creativity-Fact-Sheet.pdf. The Report explains a number of initiatives being carried out to improve U.S. domestic patent policies and processes, including patent quality. 58. What measures is the U.S. Government pursuing directly with a view of reducing law suits brought by “non-practising entities” also known as “patent trolls”? RESPONSE: Without commenting on the characterization of “non-practicing entities” and “patent trolls,” there have been a number of recent changes to the patent litigation landscape in the United States including judicial decisions and amendments promulgated by the Judicial Conference of the United States to the Federal Rules of Civil Procedure in December 2015. The effects of these changes on the patent litigation landscape continue to be reviewed. The Report explains that section 337 of the Tariff Act of 1930 investigations are instituted by the United States International Trade Commission (USITC); administrative law judges make an initial determination of whether there is an infringement/contravention of the law, which is then subject to review by the USITC. If the USITC determines that Section 337 has been violated, it may issue exclusion orders, cease and desist orders, or both, after considering the effect of the orders on four statutory public interest factors. Exclusion orders direct the CBP either to bar entry into the United States of infringing goods from whatever source (general exclusion orders) or to bar entry of imports from specifically identified entities (limited exclusion orders). The President may disapprove a USITC order within 60 days. 74. How many times as a U.S. President disapproved a USTITC order? RESPONSE: For clarity, in 2005 the United States President delegated to the United States Trade Representative the authority to disapprove a USITC determination finding a violation of section 337. United States Presidents have invoked the authority on five occasions, from 1978 to 1986. The USTR disapproved a USITC determination on one additional occasion, in 2013. As noted in response to a different question, section 337 is only one of a range of IP enforcement avenues potentially open to parties. Negotiations on the Trans-Pacific Partnership (TPP) Agreement were concluded in October 2015 and the Agreement signed in February 2016, but ratification is still pending. The United States is actively engaged in negotiations to liberalize trade further, notably in the form of the Environmental Goods Agreement (EGA) and the Trade in Services Agreement (TiSA). 1. U.S. President-elect Donald Trump said that he will issue an executive order to withdraw from the TPP on the first day that he is in office. In the U.S., what is the legal status of a trade agreement already signed but not yet ratified? What is the role of the U.S. President in the ratification process of a regional trade agreement, and what is the legal effect of the role? RESPONSE: We remind Members that TPRs are retrospective reviews. We look forward to keeping the Membership informed as the new Administration comes into place. 2. If the U.S. withdraws from the TPP, will the original policies or commitments between the U.S. and the other TPP members, particularly policies on cross-border free data flow, remain in effect? 3.Donald Trump’s policies are casting shadows over the prospect of the TPP, NAFTA and the negotiations of many bilateral trade agreements. How does the U.S. view and assess the resulting effect on global trade and the multilateral trading system with the WTO at its core? How would the US comment on the potential impact on the open trade policy of America? the Membership informed as the new Administration comes into place. 4. How would US comment on FTAAP and RCEP? RESPONSE:There is no FTAAP to join. FTAAP is an aspirational goal of a free trade area inspired by APEC, a non-negotiating forum. FTAAP is not a separately negotiated FTA but is to be built on high-standard, comprehensive FTAs that address so-called next generation trade and investment issues. With respect to RCEP, we recognize that other WTO Members are pursuing bilateral and regional trade liberalization initiatives and, like other Members, await the results of that negotiation. 5. Is there any intention for U.S. to join RCEP and FTAAP? RESPONSE: There is no FTAAP to join. With respect to RCEP, we remind Members that TPRs are retrospective reviews. We look forward to keeping the Membership informed as the new Administration comes into place. 110.Standard organizations in the U.S. are now formulating their own policies regarding standard essential patents without a unified rule, which increases the uncertainty andcost of the whole procedure. Does the U.S. have any consideration on the balance of interests of patent owners, standard enforcement organizations and the public? Will the U.S. consider promulgating a unified federal rule regarding standard essential patents? RESPONSE: The private sector leads standards setting in the United States, including in the development of the policies of Standards Setting Organizations regarding standard essential and other patents. It is unlikely that there is a single approach to such policies that would best serve the wide range of standards setting organizations, and attendant circumstances that may change over time. Variation among SSOs’ patent policies could be beneficial to the overall standards setting process. 118.Up to now, how many SEP holders have initiated the 337 investigation procedures? How about the results? Please provide a list of all relevant cases and whether or not an exclusion order and/or cense and desist order is issued finally. RESPONSE: A historical review of all section 337 investigations is beyond the scope of the current Trade Policy Review. Information on section 337 investigations is available at www.usitc.gov and https://pubapps2.usitc.gov/337external/. 119.In the 337 investigation procedures initiated by the SEP holder LSI against companies such as Realtek, ITC affirmed that the case did not meet the criteria required by Section 337 for “domestic industry”. As a result, ITC did not issue exclusion orders and/or cense and desist orders to Realtek. Please explain why the ITC considered that the domestic industry standard of the case was not met? requirement and other issues are set out in the Commission’s Opinion in Certain Audiovisual Components and Products Containing the Same, Inv. No. 337-TA-837 (March 26, 2014). Information on section 337 investigations is available at www.usitc.gov and https://pubapps2.usitc.gov/337external/. 120.The U.S. domestic courts can issue exclusion order on infringing products. What are the standards for the issuance of injuction by the courts? What are the standards for the issuance of injunction on SEP? Please provide the list of all SEP infringement cases heard by the US courts and final rulings since 2006. RESPONSE: The United States notes that Question 120 includes an inaccurate statement on the U.S. courts and exclusion orders and that a historical review of SEP infringement cases heard by U.S. Courts since 2006 is beyond the scope of this Trade Policy Review. The referenced standards are addressed in 19 U.S.C. § 1337, eBay Inc. v. MercExchange, L.L.C., (U.S. 2006) and Apple Inc.v. Motorola, Inc. (Fed. Cir 2014). 121.Is ITC’s standard of issuing the exclusion order the same as the US domestic courts’ standard for issuing injuction? Especially in the case of LSI against Realtek, what are the considerations of ITC and U.S. domestic court respectively? If the standards are the same, please explain why they are the same; if not, please explain whether this discrepancy will influence the imported products, because ITC has adopted remedy measures against imported products that infringe SEP according to Section 337. RESPONSE: Please see the responses to Questions 119 and 120 above. 122.Exclusion order and cease and desist order issued by ITC only target imported goods but the domestic standard implementers/producers in the U.S. will never face 337 investigations. Some foreign enterprise outside the U.S. claim that ITC’s standard for issuing exclusive and cease and desist order is not the same as that of U.S. domestic courts. This leads to a certain level of discrimination against foreign goods. What is the U.S. response to the concern about and attention to the “different standards of U.S. courts and ICT on order issuance in terms of SEP infringement and the resulting discrimination against imported goods”? RESPONSE: While the intention of Question 122 is not entirely clear, it appears to include inaccurate statements regarding the relationship between section 337 and domestic standard implementers (and an unclear statement regarding section 337 and “domestic standard . . . producers” (emphasis added)). The United States rejects the suggestion of discriminatory treatment. 123.In 2013, White House Task Force on High-Tech Patent Issues mentioned in ITC LEGISLATIVE PRIORITIES & EXECUTIVE ACTIONS that “Change the ITC standard for obtaining an injunction to better align it with the traditional four-factor test in eBay Inc. v. MercExchange, to enhance consistency in the standards applied at the ITC and district courts”. Please explain the background and reasons for the statement. Does the U.S. think there is discrepancy between the standards of U.S. courts and ICT on order issuance? When and how does the U.S. plan to address the discrepancy? RESPONSE: The Task Force in question issued a factsheet fully articulating its conclusions and expectations: https://www.whitehouse.gov/the-press-office/2013/06/04/fact-sheet-white-housetask-force-high-tech-patent-issues. 66. US provides for statutory licenses under the Clean Air Act for use of patented technology that is mandated by the EPA also. What is the basis of fixing the terms of access to these technologies? Are there any guidelines to enable access? RESPONSE: The United States recognizes that Article 31 of the TRIPS Agreement permits other use of the subject matter of a patent without the authorization of the rightholder under certain conditions. Please refer to 42 U.S.C. §7401 et seq., and related implementing regulations at 40 C.F.R. Subchapter C, Parts 50-98, for potentially relevant provisions to the question. 67. Does the US provide for mandatory or compulsory license under the 28USC 1498, Bayh Dole Act and on account of anti competitive practices? Mandatory licenses exist under other environmental and pesticide related legislations also. Detailed information regarding the Patent and Trademark Law Amendments Act (also known as the Bayh-Dole Act) can be found in the U.S. Code at Title 35 (entitled “Patents”), Chapter 18 (entitled “Patent Rights in Inventions Made with Federal Assistance”). See 35 U.S.C. 201 et seq. The Act promotes the utilization of inventions arising from federally supported research or development. Detailed information regarding Section 1498 (entitled “Patent and Copyright Cases”) of U.S. Code Title 28 (entitled “Judiciary and Judicial Procedure”), Chapter 91 (entitled “Court of Federal Claims”) can be found at 28 U.S.C. 1498. Detailed information regarding U.S. competition law can be found in the Sherman Antitrust Act, the Clayton Antitrust Act, and the Federal Trade Commission Act. The Department of Justice and the Federal Trade Commission has also issued Antitrust Guidelines for the Licensing of Intellectual Property. Those guidelines are currently in the process of being updated. Information can be found at the Department of Justice website, at www.doj.gov. 68. What is the procedure for issue of these compulsory/mandatory licenses? Do they apply irrespective of the field of technology? RESPONSE: The United States does not accept the characterization of the legal provisions referenced in this question. Additional detailed information on these legal provisions can be found under Question 67. 69. How many such cases of compulsory license have issued in the US especially in the context of USC 1498 and the “March in Rights”? RESPONSE: The United States does not accept the characterization of the legal provision referenced in this question. Additional detailed information on this legal provisions can be found under Question 67. US Government has remedies beyond legal provisions, to ensure that an action which is beneficial to the larger interest of the US economy and its consumers is taken. Executive Orders of the President can be issued to address specific situations and to overturn determinations made by judicial bodies. Some years ago a federal order overturned the determination of the USITC in the Apple Vs Samsung Case. 70. What forms the basis of such decisions? Can the concern that forms the basis of the decision go beyond health urgency and public safety? RESPONSE: This response does not attempt to address inaccurate assertions found in the chapeau text introducing Questions 70 and 71. Based on the reference in the chapeau to the United States International Trade Commission (USITC), it appears that Questions 70 and 71 refer to the statutory authority of the United States President (delegated to the United States Trade Representative (USTR) in 2005) to disapprove certain determinations of the USITC under section 337 of the Tariff Act of 1930, as amended. The United States notes first that section 337 is only one of a range of IP enforcement avenues potentially open to parties. Information on the basis for the referenced decisions is provided at 19 U.S.C. section 1337 and S. Rep. No. 93-1298, 93d Cong. 2d Sess. 199 (1974). The bases for individual decisions to disapprove are set out in a notice from the United States President or the USTR to the USITC. 71. What is the due process that is followed before the order is brought out? Is it open for review-including judicial? RESPONSE: Information on the procedures governing determinations under section 337 can be found at 19 U.S.C. section 1337 and 19 C.F.R. section 210. A USITC final determination is appealable to the U.S. Court of Appeals for the Federal Circuit. 76. Does the US provide data exclusivity protection from the date of first registration or from the date of registration in the US? RESPONSE: The United States provides the following relevant information regarding applicable processes and periods relating to regulatory data protection in the United States. Detailed information regarding the Drug Price Competition and Patent Term Restoration Act can be found in U.S. code title 21 (entitled “Food and Drugs”), chapter 9 (entitled “Federal Food, Drug, and Cosmetic Act”), section 355 (entitled “New drugs”). Additionally, with respect to biological products, detailed information on the Biologics Price Competition and Innovation Act can be found in U.S. code title 42 (entitled “the Public Health and Welfare”), section 262 (entitled “Regulation of biological products.”). With respect to agricultural chemicals, detailed information on the Federal Insecticide, Fungicide, and Rodenticide Act can be found at U.S. code title 7 (entitled “Agriculture”), chapter 6 (entitled “insecticides and environmental pesticide control”). 77. Is there a specific period from the date of first registration within which protection must sought to enable data exclusivity protection? RESPONSE: Please see the detailed information provided in response to question 76. 78. What is the process followed in case of agrochemical substances? What are the modalities that must be completed by generic suppliers of agrochemical substance? RESPONSE: Please see the detailed information provided in response to question 76. A narrative description of the process and mechanisms for obtaining data protection are provided at https://www.epa.gov/pesticide-registration/about-pesticide-registration. 79. What is the difference between market exclusivity and data exclusivity? Can validity of market exclusivity outlast data exclusivity? RESPONSE: The meaning of the terms “market exclusivity” and “data exclusivity” as used in this question are unclear from the question. Please see the detailed information provided in response to question 76. 80. What is the underlying basis for market exclusivity? RESPONSE: Please see the detailed information provided in response to question 76. Additionally, relevant information can be found at the following links, among others: http://www.accessdata.fda.gov/scripts/cder/ob/default.cfm and https://www.epa.gov/pesticideregistration/petitions-filed-establish-new-exclusive-use-periods-specific-commodity. 125. The enactment of the Trade Facilitation Act by the USA in Feb 2016 can lead to imposition of sanctions if the countries categorized as “Priority Watch List” under Special 301 do not provide “adequate and effective” protection of intellectual property rights or “fair and equitable market access to United States persons that rely upon intellectual property rights”. Since under World Trade Organisation jurisprudence, legality of unilateral actions over sovereign countries is questionable, does this domestic legislation of the USA not go beyond the provisions of WTO? RESPONSE: The protection and enforcement of IPR supports high-paying jobs, stimulates and promotes creative industries, and provides important solutions for pressing global challenges, for example including, clean energy technologies, new and improved medicines and health treatments, and technologies to improve agricultural yields. In that connection, Congress has charged the USTR to provide the annual the Special 301 Report provides an assessment of countries’ IPR regimes and identifies countries that do not provide adequate and effective protection of IPR or fair and equitable market access to United States persons that rely upon IPR protection. The United States encourages the listed countries to address the barriers and challenges identified in the Report. When countries make progress to address these barriers and challenges, those steps are highlighted as positive actions. 126. The U.S. invokes the Special 301 provisions to try and influence other countries’ IP laws, which are TRIPS compliant and are domestic in application. Further, among many of the recommendations of the United Nations Secretary-General’s High-Level Panel on Access to Medicines Report issued in September 2016, one of the recommendations specifies that countries “must refrain from explicit or implicit threats, tactics or strategies that undermine the right of WTO Members to use TRIPS flexibilities.” Under such circumstances, is the Special 301 TRIPS compliant? RESPONSE: The Special 301 Report provides an assessment of countries’ IPR regimes in order to determine whether countries provide adequate and effective protection of IPR. Among the key areas highlighted in past Special 301 Reports are domestic laws in foreign countries that either fail to provide adequate and effective protection of IPR or deny fair and equitable market access to U.S. rights holders. The assessments set forth in the Special 301 Report are based on various critical factors, including, where relevant, the Doha Declaration on the TRIPS Agreement and Public Health. As affirmed in the Doha Declaration on the TRIPS Agreement and Public Health, the United States respects a trading partner’s right to protect public health and, in particular, to promote access to medicines for all. An effective, transparent, and predictable IPR system is necessary for both manufacturers of innovative medicines and manufacturers of generic medicines. 129. What are the views of the US on the issue of evergreening of patents, considering that the US itself restricts or invalidates patents on the basis of “secondary considerations”, and also in light of the United Nations Secretary-General’s High-Level Panel on Access to Medicines Report that has specifically recommended that countries should use measures to prevent evergreening of patents? RESPONSE: The United States notes that there is no common understanding of the concept of “evergreening.” The United States strongly supports that patents be made available for all inventions, whether products or processes, in all fields of technology, provided that they are new involve an inventive step, and are capable of industrial application. Certain countries, including India, have applied patentability criteria, including through the application of India’s Section 3(d) “enhanced efficacy” standard, in a way that has led to rejections of patent applications for innovative pharmaceutical products that have received patents in other countries. Patents provide critical incentives for the biopharmaceutical industry to develop new and enhanced treatments that benefit patients worldwide. The United States supports ensuring that patents are available for eligible biopharmaceutical inventions, including for potentially beneficial innovations, which could include drugs with fewer side effects, decreased toxicity, improved delivery systems, or temperature or storage stability. The United States is deeply disappointed with the Report of the High-Level Panel on Access to Medicines and it recommendations. Effective intellectual property rights and liberalized trade have played an important role in incentivizing the development of medicines and bringing them to new markets. The narrowly-focused mandate of the panel was flawed and did not produce outcomes that adequately address the complex issue of access to medicines. The United States Government remains committed to advancing access to existing and new medicines, including by supporting innovation through robust intellectual property protections and working with public and private partners to find new solutions to the world’s pressing public health challenges. 133. Recently, a German court has granted a CL to a US company. What are the views of the US in this regard, and whether such a CL is justified? How does the US differentiate such compulsory licenses issued in favour of US companies from those issued in other countries to non-US companies? RESPONSE: There is no contextual information provided in this question, and it appears is more appropriate for Germany or the European Union. 134. As per testimony given before the USITC, any federal agency can rely upon 28 USC § 1498(a) to limit remedies for the infringement of patents, copyrights, plant variety rights [28 USC § 1498(d)], mask works [protection of semiconductor chips-chapter 9 of title 17] and designs (chapter 13 of title 17 [28 USC § 1498(e))] to compensation only. By removing the possibility of an injunction to enforce an exclusive right, the US government has the equivalent of a compulsory license on intellectual property rights covered by the statute. There are several examples in this regard. Thus, there is a compulsion involved in these actions; how are these then different from Compulsory Licenses (CL) issued under patent laws by various countries in accordance with the TRIPS Agreement and the Doha Declaration? RESPONSE: The United States does not accept the characterization of the legal provision referenced in this question. Detailed information regarding Section 1498 (entitled “Patent and Copyright Cases”) of U.S. Code Title 28 (entitled “Judiciary and Judicial Procedure”), Chapter 91 (entitled “Court of Federal Claims”) can be found at 28 U.S.C. 1498. 135. In 2013, the United States Trade Representative through an Executive Order overturned the decision of the US International Trade Commission in the Apple Vs Samsung case, where infringement action had been initiated by Samsung Electronics for infringement of their US patent by Apple Inc. Does this mean that patent rights can be infringed on certain grounds; if so, what are these grounds? Does the US government have any plans to accord similar relief to foreign companies infringing US patents? decision to disapprove this determination does not mean that the patent owner in this case is not entitled to a remedy. On the contrary, the patent owner may continue to pursue its rights through the courts.” USITC Section 337 cases are governed by standards established by law and regulation, the application of which is made without regard to the nationality of the parties involved. 136. The Bayh-Dole Act permits a university, small business or non-profit institution using federal funds for research leading to an invention, to retain the title on any patent issued for such inventions. Under 35 U.S. Code § 204 which relates to preference for United States industry, no small business firm or non-profit organization, or their assignee, which receives such title to the patent, shall grant to any person the exclusive right to use or sell any invention in the United States, unless such person agrees that any products embodying the invention or produced through the use of the invention will be manufactured substantially in the United States. Can preference be given to domestic manufacturing over imports, and is this TRIPS compliant? Will the US support other Governments’ initiatives to have local manufacturing provisions? RESPONSE: The United States considers its trade obligations and the specific requirements of each technology to determine if the “substantial manufacture” requirement is met. 141. What is the reason for the U.S. not making its Copyright Act compliant with the WTO Agreement on Trade Related Aspects of Intellectual Property Rights (TRIPS), effectively limiting the scope of protection for sound recordings, despite sound recordings being recognised as “works” under US copyright law? This is despite losing a WTO case on the issue and settling the same with the EU. RESPONSE: Without commenting on the accuracy of the question’s characterization of a decision of the Dispute Settlement Body, the United States continually seeks to improve its system for copyright protection and enforcement, including complying with decisions of the Dispute Settlement Body and providing robust copyright protection and enforcement, including to all foreign rightsholders, who thrive in the U.S. market The United States has resolved the vast majority of disputes in which the Dispute Settlement Body has issued recommendations with respect to a U.S. measure. As for the remaining few instances where U.S. efforts have not yet been successful, the United States has been working actively towards resolving such matters. The United States has a strong record of support for both the WTO dispute settlement system and the Agreement on Trade-Related Aspects of Intellectual Property Rights. 144. US Copyright law as interpreted by the US Supreme Court in the case of Kirtsaeng v. John Wiley & Sons which held that the “first sale doctrine” does apply to foreign made works, imperils foreign copyright holders who may wish to price their copyrighted products differently (i.e. higher) for the US market, since under the Judgement, lower priced works from foreign markets can be imported freely into the US. In the light of the above judgement, does the US law have national or international exhaustion of IP rights of Copyrights? RESPONSE: The U.S. Supreme Court’s decision in Kirtsaeng v. John Wiley & Sons is available at https://www.supremecourt.gov/opinions/12pdf/11-697_4g15.pdf. The full impact of that decision is currently being interpreted by the judiciary. Congress has not made any changes to copyright law as a result of this decision.